Introduce your friends and family to a life of luxury in this generous 8-person rectangular spa. Each occupant is sure to be comfortable while relaxing in one of the contoured seats and taking advantage of the therapeutic benefits of 45 stainless steel jets. Grab a vacation in your own backyard with the Delia 60-Jet Spa. Seating 6 people comfortably, this spa features a full body, no-float lounger, a cool down seat and a custom moulded waterfall. The Delia Spa also features an ozonator, which offers a natural water purification system that keeps water cleaner while using fewer chemicals. Take elegance and affordability to the next level with Aqualife's Eminence spa. All 60 stainless two-tone jets and 20 stainless steel jets are powered by 3 high performance pumps that give quality zone-controlled seating. Each of the 4 captain's chairs features neck and shoulder jets and delivers optimum hydrotherapy from head to toe for you and up to 6 other people to enjoy. Customize your experience even further with this Bluetooth compatible spa. Housing two speakers in the heavy-duty acrylic shell and a subwoofer in the no maintenance exterior you have endless possibilities at your fingertips. This energy efficient 240V spa uses a 4kW Balboa all-season stainless steel heater that will continue to deliver maximum heating even during cold winter nights. Completing your spa is an insulated heavy-duty tapered cover, made a full inch thicker than industry standards, with locking clips to close your spa off from nature. Want a stay at home vacation year round? Now you can with the Tavira Spa. Seating 6 people comfortably, this large spa features a full body, no float lounger and 50 adjustable jets with 2 air controls for zoned massage control. The hot tub also comes with an ozonator that offers a natural water purification system, which works to keep water cleaner while using fewer chemicals. The Canadian Spa Company Niagara Falls hot tub incorporates an upgraded energy-saving insulation system with an added heat retention blanket to maximize efficiency. 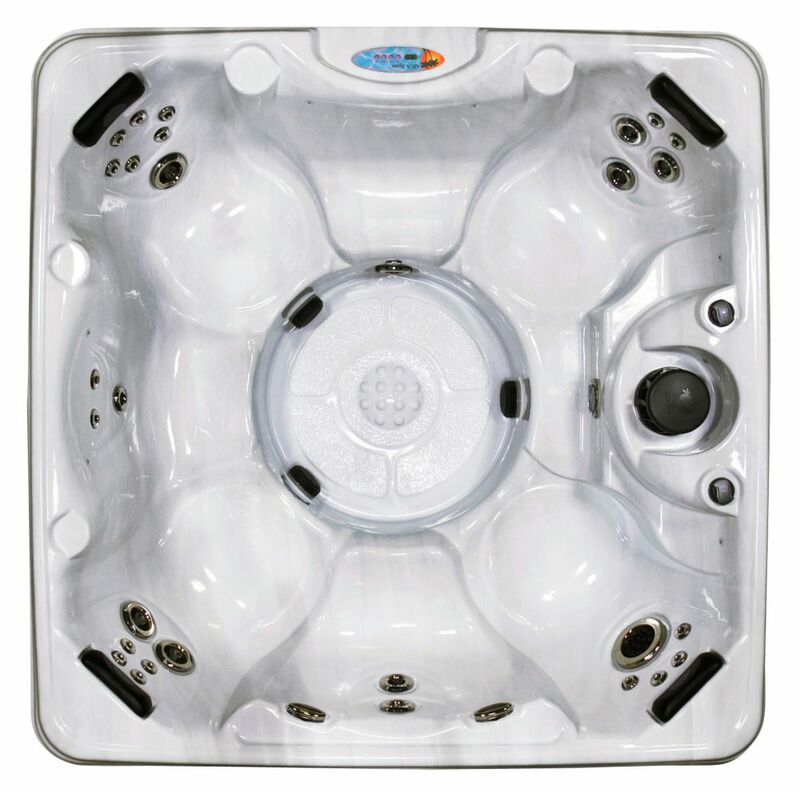 This ultra-deep, 39 inch tall spa will accommodate the largest of families with its multilevel 7-seat configuration including a contoured no-float lounger for ultimate relaxation. An internal step provides easy entry and exit from the spa, while 60 hurricane jets provide an intense massage experience. All 60 jets can be easily adjusted to provide a more thorough treatment and allow users to customize their specific seats. Our spa uses a water purification system that incorporates an ozonator to produce ozone which travels through a mazzei injector system to create smaller bubbles that enter a mixing chamber to ensure full absorption in the water. This purification system along with 100 sq ft of Microban Glacier filtration keeps your spa water crystal clear, all year round without any hassle. Sundial Beach 8-Person 45-Jet Spa with LED Lights and iPod Stereo System in Silver Marble Introduce your friends and family to a life of luxury in this generous 8-person rectangular spa. Each occupant is sure to be comfortable while relaxing in one of the contoured seats and taking advantage of the therapeutic benefits of 45 stainless steel jets.